Crisp morning air. Fog on the mountains. Leaves becoming beautiful flowers before carpeting the woodland floor with their beauty. All indicators that Autumn is nearly here abound. The transition between Summer and Fall in Bath County is beautiful. But then when is Bath County anything but beautiful? When will the leaves be at their peak? Well that is certainly up to Nature but we would like to think that the trees will be fully adorned with their Autumn cloaks about the second week in October. Fall is full of exciting activities in Bath County! October 1-7, 2018: Plein Art Festival celebrates the tradition of outdoor painting. 30 nationally acclaimed artists will paint on location throughout beautiful Bath County. Visitors and locals will have opportunities to observe artists as they paint or listen and learn from daily demonstrations. For a full list of activities during the festival, please visit https://www.bathcountypleinairfestival.org/. October 7, 2018: Cascades Golf Tournament – Captain’s choice 4 person tournament played at the beautiful Cascades course at Omni Homestead Resort. Visit http://countyofbathchamber.org/page/golf_tournament for availability, pricing and additional information. October 12-14, 2018: Fall Foliage Weekend I at Garth Newel Music Center. For more information or tickets, please visit http://www.garthnewel.org/. October 13, 2018: Apple Day: A Celebration of Appalachian Heritage and Arts and Crafts Fair at Douthat State Park. Enjoy the fruits of fall, hay rights, bluegrass music and great food. 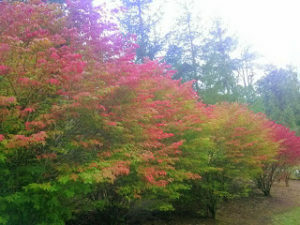 October 19-21, 2018: Fall Foliage Weekend II at Garth Newel. October 26-28, 2018: Fall Foliage Weekend III at Garth Newel. For additional information, locations, times, and other upcoming events please visit https://discoverbath.com/. “Everyone must take time to sit and watch the leaves turn.” – Elizabeth Lawrence. 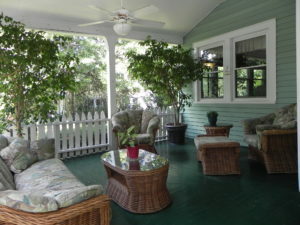 There is no better place to unwind, sit and watch the leaves turn than the front porch at Vine Cottage Inn. If you are thinking of visiting Bath County in October call Vine Cottage Inn at 540-839-2422 or visit our website at www.vinecottageinn.com to make your reservation today!